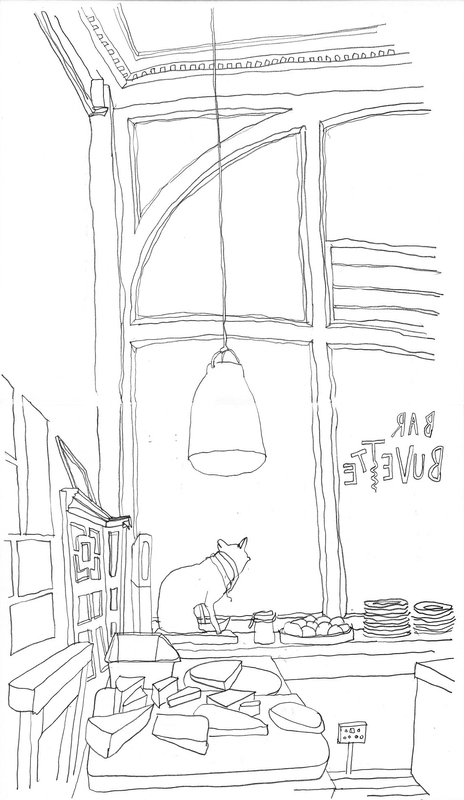 This sketch was done at the wonderful Bar Buvette – the new biodynamic, organic and natural wine bar in Bristol. Run by Peter and Max it began life as a pop-up at Christmas and was so popular that they applied for and gained a permanent licence. Peter also runs Auberge de Chassignolles in France and has brought his knowledge of sustainable vineyards and winemakers to Bristol in the form of a range of wines that are a genuine joy to drink. Of the wines we tasted, the Faugeres in particular (a red wine from Clos Fantines) has an exquisite depth of taste, as does the Riesling with its beautiful golden colour. There seems to be something special about biodynamic wine. As Peter said, it is difficult to describe what it is that makes them different, but they seem to have something that wines from chemically-treated grapes do not. We are beginning to think of this difference as lifefullness – the energy that biodynamic growers look to draw from the soil up through the grapes, while connecting to the wildlife, the local landscape, the community, and ultimately the universe beyond. Perhaps it is this lifefullness that flows into the wines and gives them that indefinable quality. The success of Bar Buvette is also a lovely example of the increased value that people are placing on sustainable ways of living – and how we are learning to value food and drink with integrity and authenticity. If you have never tasted biodynamic wine then we would recommend a visit.